If we all shopped high end beauty products all the time, everyone will be broke. In order to have good makeup or hair, it is not necessary to use expensive products. There are a lot of drugstore brands which also have products that are great and best of all affordable. 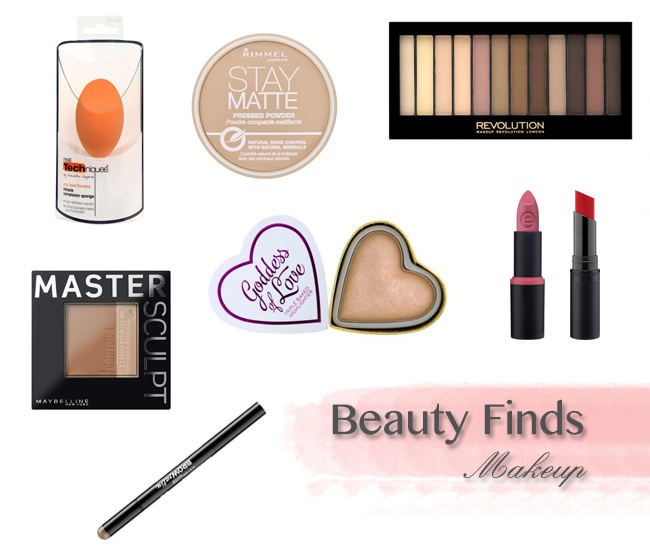 There are certain items which I would splurge on but I use quite a lot of drugstore products and thought it would be great to put together some 'Beauty Finds' posts. I'm starting off this series by sharing a couple of makeup products I've either tried and loved or just heard great reviews about. Starting off with a makeup tool, my current favourite way of applying makeup is using a beauty sponge. I've been using the Real Techniques Miracle Complexion Sponge and I love it because it makes my makeup look more natural and is very easy to clean. I have a full review here, if you'd like to have a read. Next is a product I feel is very important for those with oily skin, but not only. The Rimmel Stay Matte Pressed Powder is great for reducing shine and setting your makeup. I'm trying this one next in the shade transparent. When you apply foundation, some of the hollows of your face are covered up and I think it is important to put back some definition using a bronzer or contouring product. I've been loving the Sleek Face Form Palette but it didn't make it into this list as it costs a bit more than €10. But a lot of people like the Maybelline Master Sculpt Contouring Palette which offers a contour powder and a highlighter. Makeup Revolution have some great products at affordable prices. I've tried their Hard Day Salvation Palette and it is a beauty. I'm a matte girl at heart mostly so the Essentials Mattes 2 Palette caught my eye and is on my list of products to try from this brand. I've also included the Blushing hearts Goddess of Faith Highlighter because I just couldn't get over how pretty the colour is when I saw the review on Mac and Cheese. It is a baked highlighter which I feel would suit any skin tone. Next up is an eyebrow product as I thought it was only fair I include it since I fill in my eyebrows all the time. My favourite product to use lately has been the Maybelline Brow Satin which is an eyebrow pen and powder in one. I did a review on it earlier, and have finally learnt how to use it without breaking the tip when doing my right eyebrow. And lastly, I couldn't skip lipsticks because I feel they add colour to your face, and make minimal makeup look more polished. There are loads of affordable brands of lipsticks available, but two brands I use a lot are Essence and Catrice. My favourite shade from the Essence Longlasting Lipsticks range is natural beauty as it is a neutral pink shade that goes with everything and is perfect for everyday use. Catrice recently released some new Ultimate Stay Lipsticks which I haven't gotten to try yet, but I'm sure they will not disappoint me. What products do you love that cost less than €10?